Submit an abstract by 1 January 2019. Download the abstract template. The 2018 AGU Fall Meeting in Washington, D.C. will take place 10-14 December. We would like to bring the following sessions to your attention. An integrated modeling workshop, sponsored by Cornell University and Iowa State University, will be held at the David R Atkinson Center, Cornell University, Ithaca, NY during April 3-5, 2019. The workshop organizers are Dave Keiser (Iowa State University), Cathy Kling (Cornell University) and Dan Phaneuf (University of Wisconsin, Madison). Abstracts are being solicited that describe integration of the Soil and Water Assessment Tool (SWAT), Agricultural Policy/Environmental eXtender (APEX) and/or other ecohydrological or environmental models, with economic models or other types of models. Accepted abstracts will also be considered for a special issue of Land Economics. Additional details regarding the topics of interest and abstract submission process. From 5th to 7th October 2017, a SWAT training given by Dr José-Miguel Sanchez-Pérez (CNRS, Toulouse, France), Dr Sabine Sauvage (CNRS, Toulouse, France), Dr Didier Orange (IRD, Montpellier, France) and PhD Walid Ben Khélifa (INRGREF, Tunis, Tunisie), on “Introductory SWAT Course” has been delivered for 16 researchers, students and engineers as side-event of the international seminar “Colloque-Formation international Eau-Société-Climat’2017” (ESC-2017), organized by Prof. Noureddine Gaaloul (INRGREF, Tunis, Tunisia) at Hammamet, Tunis (Tunisia) from 2nd to 7th October, co-funding by PHI-UNESCO (FRIEND-Water network), INRGREF, IRESA and IRD, with the key support from ASTEE-Tunisie. During the SWAT training, 8 countries from West Africa were represented (Algeria, Benin, Burkina Faso, Cameroun, Ivory Coast, Morocco, Niger and Tunisia), 20% from Maghreb (Algeria, Morocco, Tunisia). This international cooperation South-South-North has opened a large numbers of research opportunities on River Basin Management, Hydrology and Ecohydrology. CNRS in Toulouse, France under the European project INTERREG SUDOE VB AGUAMOD, is hosting a training course taught by Professor Karim Abbaspour of EAWAG (SWITZERLAND) from the 25-27 of September. The course focuses on the use of SWAT-CUP tools for self-calibration and analysis of uncertainties around the SWAT model. The partners of the project will be meeting all week to work on the modeling of the French, Spanish and Portuguese watersheds of the SUDOE territory. Throughout the week, the partners will discuss the technical aspects and progress in the modeling projects of the SUDOE territory. 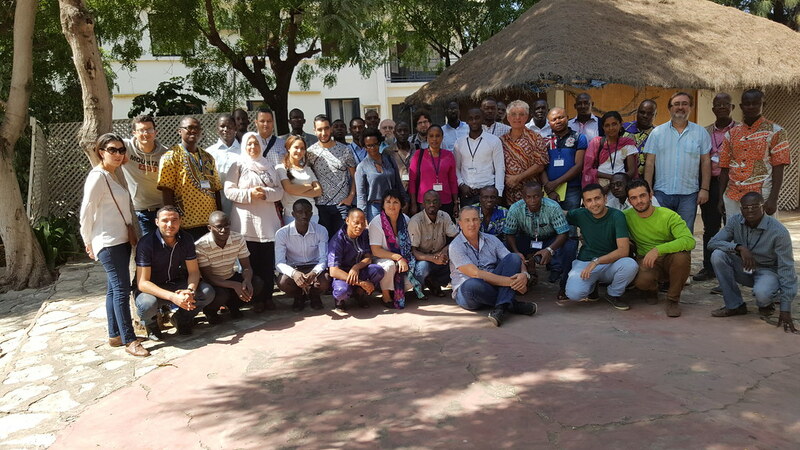 From 1st to 3rd December 2016, a SWAT training course on “Initiation on SWAT model” has been delivered for 38 researchers, students and engineers at the UCAD-IRD Centre of Dakar-Hann (Dakar, Senegal) by José-Miguel Snchez-Pérez (CNRS, France) and Sabine Sauvage (CNRS, France) with the support of Didier Orange (IRD, France) and Amine Zettam (Université of Tlemcen, Algeria). This training course was coupled to the FRIEND-IAHS seminar (28th to 30th November at UCAD, Dakar), co-funding by PHI-UNESCO and IRD, with the key support from UCAD, EPS, OMVG. During the SWAT training, 13 countries were represented, mainly from West Africa (Benin, Burkina, Ivory Coast, Niger and Senegal), Maghreb (Algeria, Morocco, Tunisia), Central Africa (Congo-Brazzaville, RCA and Zimbabwe) and Europe (Germany, France). This international cooperation South-South-North has addressed 11 River Basins from the whole African Continent, and has opened a large numbers of research opportunities on River Basin Management, Hydrology and Eco-hydrology. Cesar Izaurralde, Bill McGill, and Jimmy Williams have incorporated the PHOENIX soil carbon and nitrogen model into APEX, giving users the option of choosing either the CENTURY or PHOENIX approaches to simulating soil carbon and nitrogen dynamics. For more information contact Dr. Williams (williams@brc.tamus.edu). Cody Zilberberg, Jay Angerer, Lori Metz, and Jimmy Williams are working to introduce both interspecies plant competition and selective grazing into APEX. They are using modules for plant competition based on the ALMANAC model and the selective grazing component of PHYGROW. This development will allow APEX to realistically simulate grazing by and weight gain of cattle, sheep, and goats, as well as calving and weaning dates, rotational grazing, and methane emissions. For more information contact Dr. Williams (williams@brc.tamus.edu). Kate Behrman and Mari-Vaughn Johnson are working with Jimmy Williams to develop an improved wetland component for APEX. It is based on the denitrification subroutine developed by Cesar Izaurralde. Contact Dr. Behrman (kate.behrman@ars.usda.gov) for more information.